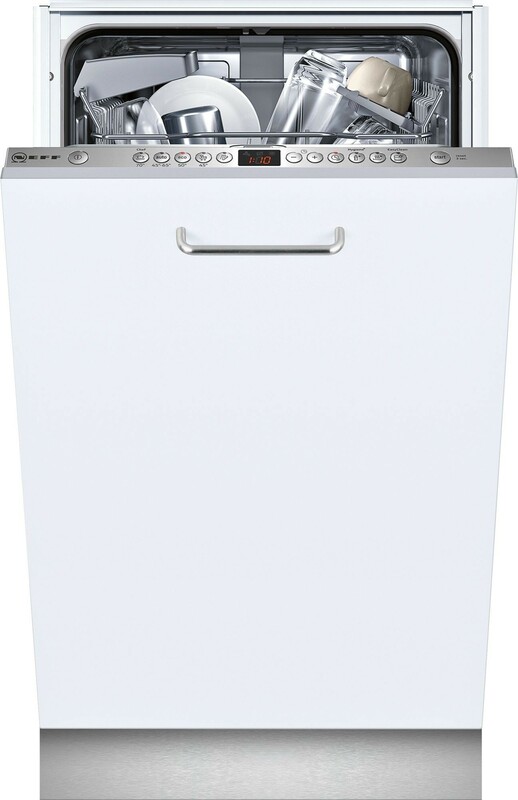 The NEFF S583C50X0G Slim Line Dishwasher comes with 5 programmes and room for 9 place settings. For super speedy dishwashing, the VarioSpeed Plus cleans your dishes up to 66% quicker – without compromising on quality. With nine place settings and an A rated wash and drying performance, it's perfect for busy households. Thanks to its innovative VarioFlex baskets, this dishwasher has plenty of space for all your pots, pans, dishes and glassware. Ideal for more efficient cleaning of bulky items - by folding the racks you can place bigger dishes and pans flat in the basket, allowing spray from all sides of your machine to clean more thoroughly. There are 2 foldable plate racks in bottom basket, 2 foldable cup shelves in top basket, knife rack in top basket and small variable cutlery basket in bottom basket. RackMatic also allows you to extend, raise or lower the top basket, for total flexibility, even when fully loaded. AquaStop works to protect your dishwasher from overflowing caused by additional water and leaks, even when the appliance is turned off. The S583C50X0G also features a child safety lock to prevent children from opening the door easily. Running almost silently, this super quiet dishwasher is ideal for use during the night when energy costs are usually cheaper. You can enjoy optimised cleaning results, thanks DosageAssist, which detects the type of detergent being used and adjusts the cycle accordingly. The Heat exchanger system also delivers protective cleaning for your delicate glassware, leaving them beautifully clear and shiny.